I've always walked and hiked a lot, especially in the past few years. I've realized that I notice more in the world and have more opportunities to reflect on things going on in my life when I go outside, putting one foot in front of the other. The other day, during this cool December month, I was walking just after sunrise, noting the whiff of firewood from the night before, and found myself gazing at a large maple tree down the street from my home. 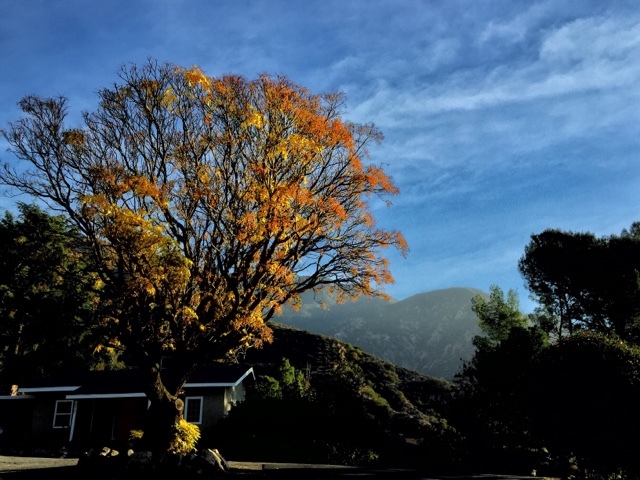 I know this tree well, as it stands in front of a small house and is naturally decked out at this time of year with exhilarating autumn colors. I stared at the shimmering golden maple leaves, and the unraked layers scattered around the base. As I got closer, feet crunching on fallen foliage, I was struck by an odd vision. Two or three leaves were spinning wildly as they clung to the branches. They were twirling in the wind, trembling, vibrating on the bare twigs. What made me take notice of these particular leaves was the obvious contrast to the other thousands of others on that tree. The other golden forms were perfectly stationary, as though in a painting. Motionless. Oblivious to those two or three quaking ones just a few feet away. I thought, "Oh, I actually might be able catch these spinning leaves just as they fall away to the ground - a perfect autumn moment on my walk." So I stepped towards the tree and gazed at the shivering ones hoping to catch them in the act of falling. I came to a stop on the lawn below the leaves. I watched and waited to see a spectacle that admittedly is repeated millions of times a day this time of year, but would be seen only by me, at this moment, at this place. But it didn't happen, at least not in the way that I expected. As it turns out, as I was staring at the twirlers, I saw out of the corner of my eye an unexpected movement. I turned my head, and one of those motionless leaves broke off and started to drift downwards, wafting this way and that, before gently landing on the damp ground below. It was one of the stronger leaves that fell. I looked up, and the spinning leaves still quivered manically in the wind. I looked up and the stationary ones still remained motionless. So I got to see a leaf fall. What I saw was what I wanted to see, what I waited to see, but it wasn't how I expected to see it. And as I took a couple of steps back towards the street, one last shape caught my attention. I saw pigtails and two large blue eyes. It was as though a young child - straight out of central casting to play the role of Cindy Lou Who, the tiniest tot on the Grinch Who Stole Christmas - was gazing out the front window of the modest home. Her head was propped on her hands, her elbows planted on a sofa, her big round eyes staring at the tree. It seems she hadn't noticed me. I'm not certain what she was looking at, what she was waiting for. Did she want to see the leaves fall as well? Was she wondering where her Mom and Dad had gone to at this hour? Perhaps she was wondering what was for breakfast. But she was waiting and watching up towards the tree. But as I started my departure, she moved her head suddenly, surprised to see someone else there with her. Of course, I was concerned that I had startled her. But she just tilted her head slightly and smiled. She smiled broadly, with innocence and gentleness. Advent is a season where we often run around madly, racing from one store to the next store, or from one e-store to the next e-store, staring at our phones as we wait in line. We do it because we want to make Christmas special for the ones we love, those who are planted in our lives. We do extra shopping, decorating, cooking on top of our normal chores, with work and family commitments. We spin around the city and it's a wonder we just don't collapse. That we don't fall to the damp ground below. Yet we somehow hang on. And our joys almost always come from unexpected ways. We're asked to spend Advent waiting for the baby Jesus. We're asked to be alert, to be watchful, with childlike innocence and wonder. It can often be challenging, if we let our attention drift in the wind to this mall and that concert, to this show and that party. May Advent keep us all awake at the sunrise, alert, in a state of wonder, head in our hands, staring out the window for something that perhaps only we can see, perhaps something we all can share. And may it surprise us with meaning far greater than we ever expected.